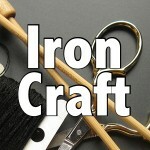 So a little confession here, often when I am posing an Iron Craft challenge I already have an inkling of what project I might do to meet it. This time with the dollar store challenge, I went in without an idea ahead of time. I just figured a quick trip around the local store would give me lots of ideas. Oh, man was I wrong. It took me four trips and a few very sad projects before I came up with this one that I really love. 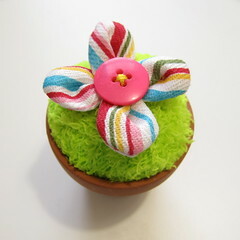 The flower pot pincushion. I have to say the dollar store near me is really pretty great, it has a floral section and a craft section. Sometimes, I even see the same craft supplies there as the Michael’s next door. In the end though it wasn’t the craft supplies that inspired me. 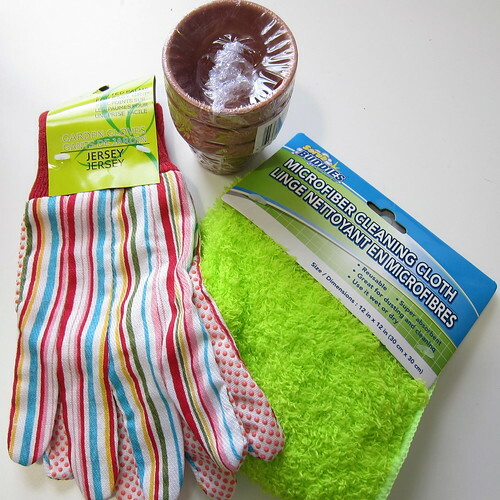 It was this bright green microfiber cloth and pretty striped garden gloves. 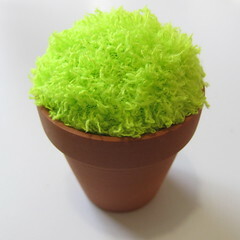 I also picked up a set of three small clay flower pots. A total of $3 spent. Now, I have to admit, a few items I used in this project I didn’t get at the dollar store. First the stuffing, I could have bought a $1 stuffed toy and used the stuffing for this, but it seemed like a waste to me as I have bags of stuffing at home. I counted it as an ok supply, because I could have sourced it at the dollar store. Second was the button, once again I could have bought something with a button and taken the button off, but I had plenty of buttons I paid less than a dollar for. The challenge okayed basic supplies like glue and thread, so they weren’t cheats. 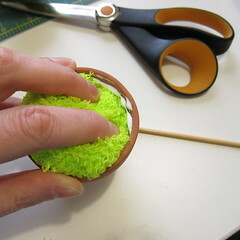 I had enough of the microfiber and pots to make three pincushions, if only I could have found gloves with six fingers. 1. 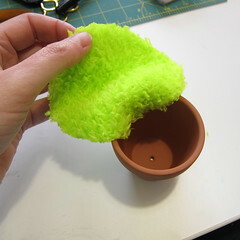 Cut a circle of the green fabric about 1/2″ bigger around than the mouth of the flower pot. 2. 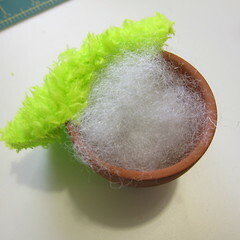 Using the glue start attaching the green fabric inside the flower pot about 1/2″ in. Work about 3/4 around. 3. Fill the pot with stuffing. You want it to be very tightly filled. I found it helped to tuck the unglued edge of the green fabric in from time to time to see if it looked and felt stuffed enough. 4. 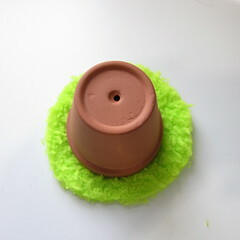 Glue the remaining edge of the green fabric inside the pot, a knitting needle helped me to push it in. If you find it is popping out because of the filling, set something heavy on top until it dries. 5. 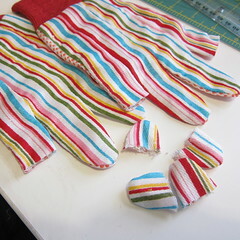 Cut 1″ off the finger tips of four of the fingers. 6. 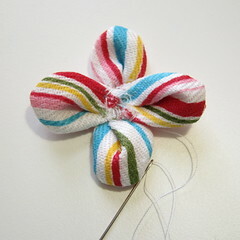 With the thread and needle form the finger tips into petals by folding the bottoms together and sewing a little pleat. I had to play with the fold a bit to get it to look right and found three folds sometimes worked best. 7. 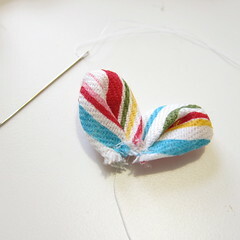 Sew the petals together to form a flower. 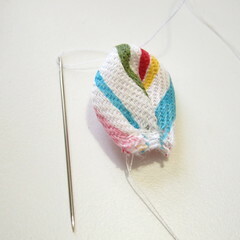 I put a little fray stop in the middle of my flower because the ends were starting to fray. 8. 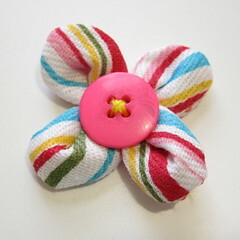 Sew a button in the middle of the flower, I used a bright contrasting color of embroidery thread. 9. 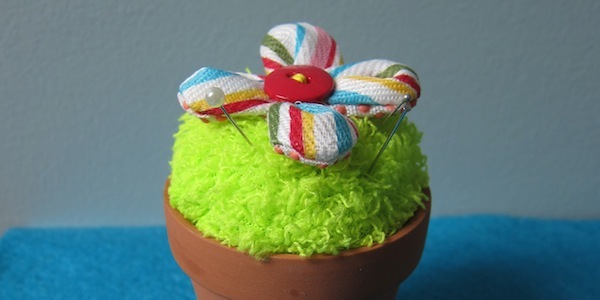 Glue or sew the flower to the green fabric in the flower pot. 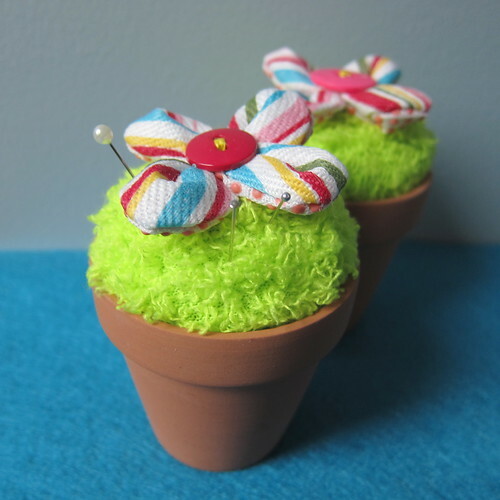 If you make a flower pot pincushion we’d love to see a picture of it in our Flickr group. 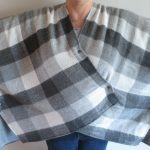 7 years ago by Kat in Challenges , Craft Projects , Crafts , Iron Craft , Needlecraft , Projects , Sewing , Sewing Projects | You can follow any responses to this entry through the RSS feed. You can leave a response, or trackback from your own site. 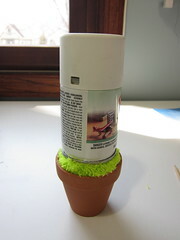 This is a great dollar store craft! We’ll be linking up soon. Also, I totally agree with you — sometimes the dollar store has the same stuff as Michael’s for 1/3 of the price. How adorable! I never thought of using the stuffed animal if I need a little filling!